Blog Quick Quotes: June Club Q with Dorlene! June Club Q with Dorlene! Hi there, it's Dorlene showing off my latest layout using the Premier Altered Kit from June's Club Q.
I didn't have a need to make a mini-album but I loved all the elements of this kit. 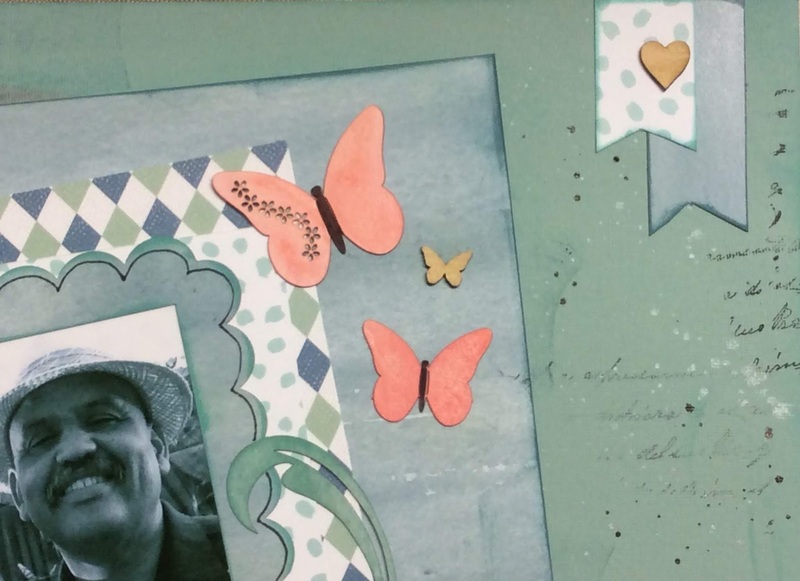 I decided to use the items to do a layout of a terribly printed photo of the hubby and me. We took this at a friend's birthday party (dress as your favorite celebrity). We were Ricky and Lucy Ricardo. It was a lot of fun but the thing is, the photo itself turned out horrible! I'm not sure what happened to the color but all the photos had this blue tinge to them. But the cool thing is that it coordinated perfectly with these patterned papers. I'm usually pretty straight forward with my scrapbooking layouts, you know...photos, title, journaling and some embellishments, but I thought I'd get a little inky and messy this time. Before adhering anything, I swiped Capri Blue, Key Largo and Tropical Punch PowderPuff Chalk Inks directly to the cardstock base. I alternated the three colors from the top to the bottom of the paper. I cut my photo down to fit the pre-cut frame and then used each of the patterned papers to layer it. Before adhering the papers together, I inked the edges of each one with coordinating PowderPuff Chalk Ink. The large white flower and both butterflies were inked with Tropical Punch as well to add some more color to the layout. It was getting to be too monochromatic and was not the look I was going for. Before completing the layout, I added some sticky back pearls, woodgrain embellishments, a cork arrow and doily. The doily was inked with a little PowderPuff Chalk Ink as well. I also added some black and white color splash & a script stamp here and there.